We're excited to announce a new Bug Bash for the Windows Insider Program to support the Creators Update. Thank you to all the Insiders that have participated in past Bug Bashes, and returning or new participants in this upcoming one. Your feedback is very valuable to us and helps shape Windows 10! Anxious to get started with your new toy? Follow these tips and avoid hours of frustration. Let's state it plainly up front: Adobe Photoshop CC 2015.x doesn't perform very well on the tablets I've tested. Brushes are laggy and multitouch gestures work intermittently, often requiring much greater finger pressure than other software. This stuttering performance might be pardonable on low-powered Atom or m3 devices like my Surface Pro 4, but they're absolutely inexcusable on an i7 Surface Book with a discrete NVidia GPU. Bafflingly, Photoshop performs better on the Surface Book when the display is detached and the Clipboard engages the native Intel HD Graphic 520 processor. A workaround for laptop mode, which I believe I passed along late last year, is to disable GPU acceleration in Photoshop's performance tab. This is a terrible brute force step that forces the Surface Book's processor to do all the heavy lifting. This week, I came across a much more nuanced approach that has shown some (subtle) improvements, especially in initial pen lag. Austin Hines of FutureLight Studios posted the video below which demonstrates the poor default pen performance and the steps required to improve it by changing the NVidia GPU's power settings. Microsoft's fancy new Surface Book with dGPU has terrible default driver settings for digital painting. You get worse Photoshop performance with the screen docked and using the discrete nVidia GPU then when it's undocked and using only the integrated Intel driver. What the heck? Because Microsoft manages display driver updates for the Surface Book, the NVidia control panel is not normally accessible on the laptop. But installing the GeForce Experience (http://www.geforce.com/geforce-experience/download) will also install the control panel. Once you've done so, right click the desktop, select NVidia control panel (see right). After installing the GeForce Experience, right click on the desktop to access the NVidia Control Panel. Under Manage 3D Settings, select the Program Settings tab and then find Adobe Photoshop under program to customize. Make sure that the NVidia GPU is selected as the program's preferred graphics processor and change Power management mode to "Prefer maximum performance." Hit apply, close the control panel and start up Photoshop. As the video demonstrates, the pen lag will be reduced about 50%, most noticeably in initial, long strokes. TabletPro, the utility formerly known as TabletPCMouse from developer LoveSummerTrue, is out of beta and now available for download from the Windows Store. The software offers a variety of features, but most important to artists is the ability to create fully-customized on-screen hotkeys for your favorite programs. TabletPCMouse V.1 owners are eligible to upgrade for $15.99. The developers also sent out an email to participants in the beta program with a free upgrade code. If you didn't receive it, contact Justice Frangipane. 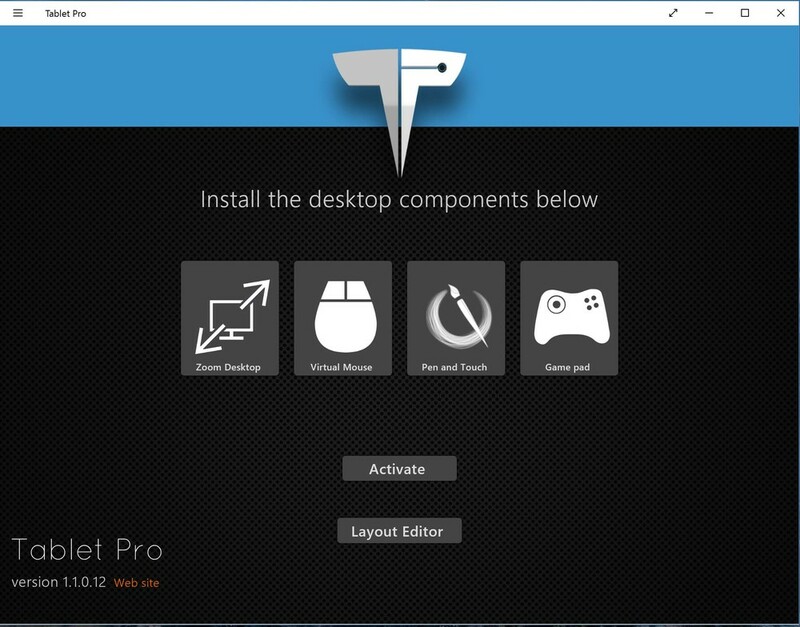 Like its predecessor, TabletPro requires both the Windows Store app and a desktop component to function. Installation is easier now as the desktop utility can be downloaded directly from the app. The default Artist Pad hotkeys (left) and the Artist Pad control panel. The included Photoshop Artist Pad hotkey configuration (left) and the Artist Pad layout window. The TabletPro Artist Pad add-on includes preset layouts for Photoshop (pictured above), Clip Studio Paint and TVPaint. The TabletPro.net forum has a section where users can upload and share their Artist Pad layouts for software like ZBrush. Although it may be a little confusing to use at first, and more than a little expensive for a utility, TabletPro is the only hotkey tool that I know of that is in active development. It's an essential addition to any artist's tablet PC.